I recently went to NOtaBLE for lunch with a fellow Health Food Junkie and we had the most amazing parsnip soup (followed by a killer grilled cheese, not so healthy, but satisfying :)). The soup was very simple, parsnip, apple with a blue cheese creme fresh on top, yum. I hadn’t made parsnip soup before, so I looked around for recipes. I found this recipe on Food Network Canada and it looked great, developed by a holistic dietician. I made a few changes based on taste. 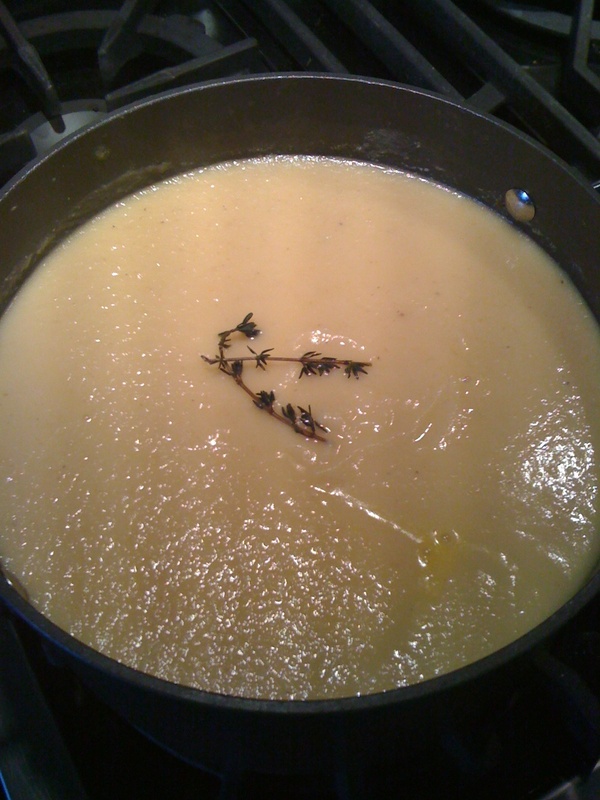 With the research I did I can experiment with recreating the parsnip and apple soup now too. There is so much to love about this soup recipe. 1. I love parsnips and could eat roasted parsnips every winter day. Mmmm, roasted with carrots and beets. Parsnips are full of vitamins, minerals and fibre. I got these fine organic parsnips from my favourite market, the Kingsland Farmers Market. 2. It calls for coconut oil. According to some health practitioners coconut oil is the most healthiest of oils. It is a saturated Medium-Chain Fatty Acid (MCFA) and is metabolized differently then saturated and unsaturated Long-Chain Fatty Acids which is what animal and vegetable fats are. Although saturated they do not negatively effect cholesterol. I won’t bore you with the science, but it is worth looking into for yourself and while you’re at it, look into why you shouldn’t be congesting margarine and oil like products. Some fats are good for you, investigate this, it is part of healthy digestion, metabolism and weight management. 3. It has white cannellini beans so it is a hearty soup, with a good source of protein and fibre. 4. It is so easy to make! You don’t even peel the carrots or parsnips. Buy organic and scrub them a little with a veggie scrub. In a soup pot, add the coconut oil, carrots, celery and onion over medium-high heat. Stir frequently until the vegetables start to brown, about 5-10 min. Add the beans, garlic, thyme, sage, salt and pepper, stir well. Cover with water, about 2-3 cups. Bring to boil and then turn down to simmer for 20 minutes. Add parsnips to pot and cover with water plus two inches over the top of vegetables, about 2-3 cups. Bring to boil and then turn down to simmer for another 20 min or so, stirring occasionally. When both the parsnips and beans are tender remove from heat. Using a hand blender, blend the soup until smooth (or let soup cool and use a blender). If the soup is thicker than you’d like (and it will thicken a bit more) add a 1/2 cup or more water. Adjust with salt and fresh cracked pepper. Serve with homemade or sourdough bread. Yum. If you want to make this same day, replace the dried beans for 2 cups of canned beans, do only one boil/simmer step, add the beans 10 min into simmering and then blend when the parsnips are done. That should work but dried soaked beans are always better – keep them in the fridge for a day or so if you run out of time to make the soup. I doubled the recipe, made a nice big pot!